This Pirate Photo Frame is a vibrant and characterful addition to any child’s bedroom or playroom. Designed and meticulously crafted by skilled Italian artisans, using birch wood and non-toxic watercolours, it features a bright and cheerful colour scheme and fabulous illustrations. This Pirate Photo Frame is a vibrant and characterful addition to any child’s bedroom or playroom. Designed and meticulously crafted by skilled Italian artisans, using birch wood and non-toxic watercolours, it features a bright and cheerful colour scheme and fabulous illustrations. 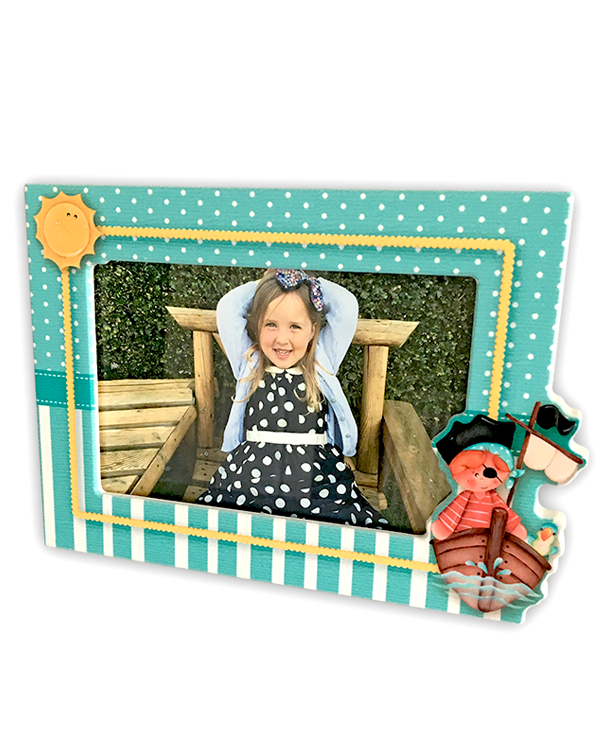 Our pirate (the star of the show) with his trademark eye patch and parrot sidekick sits proud of the bottom of this landscape frame to create a fabulous 3D effect, against a teal and yellow backdrop of polka dots and stripes. Ahoy there captain – this is the perfect gift for all little ones who love anything pirate themed! 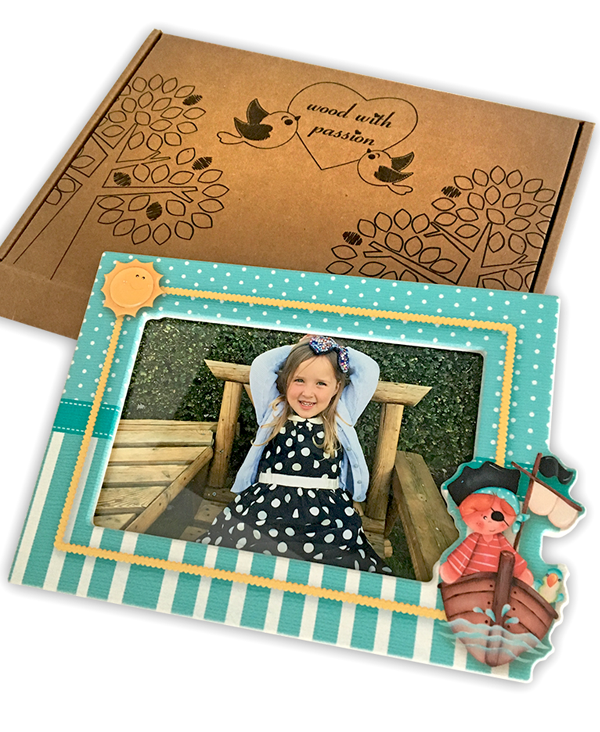 The frame takes a 4×6 inch landscape photo and is the perfect way to capture those special moments in print. This fabulous landscape photo frame is also available in portrait orientation. 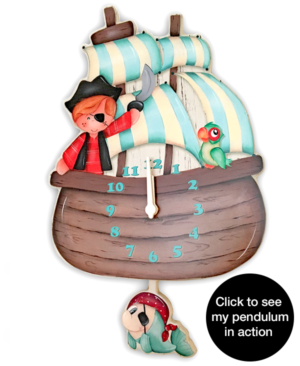 Matching Pirate Wooden Wall Clock With Pendulum and Pirate Wall Mounted Music Box are also available. This Pirate Wall Mounted Wooden Music Box is beautifully designed and crafted by skilled artisans in Italy. Made from quality birch wood and non-toxic watercolours, it’s a truly stunning piece of craftsmanship. 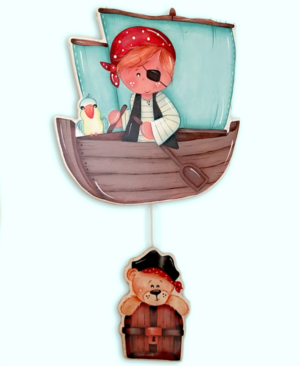 This Pirate Photo Frame is part of our gorgeous Italian collection of children’s room accessories. Made using birch wood and non-toxic watercolours, it features a vibrant colour scheme and characterful design that is sure to appeal to little ones with a love of all things pirate themed!